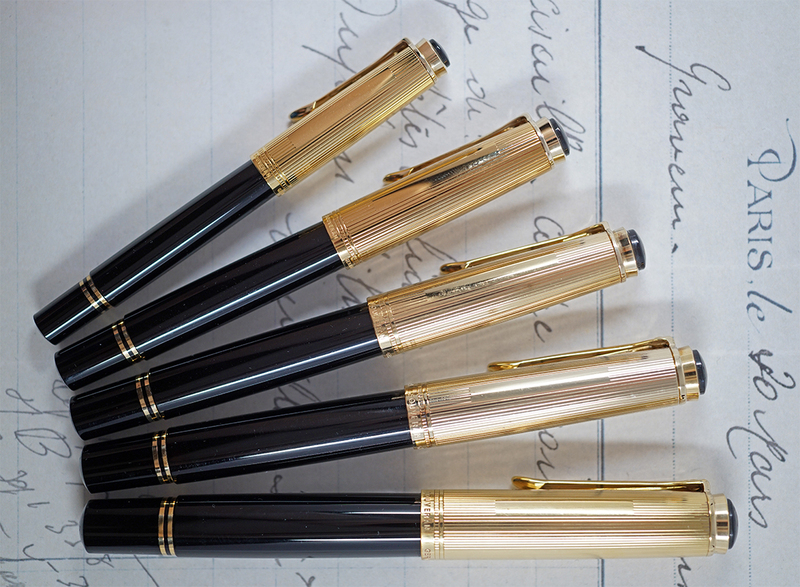 In the late 1990s and early 2000s, Pelikan introduced a series of special editions across their Souverän lines that employed sterling silver components decorated with a gold overlay. The gilding of silver is often referred to as vermeil, a French term that is actually pronounced “ver-may.” By plating sterling silver in such a way, an item can be imbued with a gold appearance at a fraction of the cost of pure gold. This should not be mistaken for simple gold plating. There are regulations that oversee what may be called vermeil in many jurisdictions. For the U.S. market, the base metal must be sterling silver with a gold coating of at least 10 carats or finer and with a thickness of 2.5 microns (1/10,000th of an inch). Mere gold plating has no such industry regulations. These upgraded Souveräns have a guilloche metal cap but otherwise maintain the same visual appearance and trim as their less gilded siblings. Each fountain pen in the series is referred to as an Mx50 and there have been nine such models over the years in addition to several companion pieces. Care should be taken not to confuse these with the M150 and M250 of the Classic series or the M750 anniversary edition which do not have any vermeil components.